Let’s call this reason #57 for having an e-newsletter. The headline is a a paraphrase of a voice mail left by a client’s client for whom yours truly writes, designs and distributes a weekly e-newsletter. The client, a retail plant nursery, had announced a special “dollar sale” on summer plants with the e-mail. As you can gather from that quote and the fact that the client volunteered that information, the sale was a big success. You’re probably saying, “Sure, you can get that type of response when you sell things for a dollar”. There’s no denying a great offer makes a difference in getting almost immediate response. Yet if this particular e-mail was the first one you received, chances are you might not have jumped in your car and went straight to the nursery as what happened with this client. This particular e-mail was successful for several reasons. The offer is one. Another is how our client collects e-mail addresses, mostly through a sign-up sheet at their two locations. So the people on the e-mail list have already visited their establishment and have a pretty good idea about the quality of the product. Yet what really makes people get in the car to take advantage of this sale is the relationship they have with our client. You see, besides an initial visit to their store, customers have received a weekly e-mail via Constant Contact since March. So, even though they may not have set foot in the store since early spring, they hear from our client every week. To the customer, it’s an ongoing dialogue. It says, “we’re still here, why don’t you check out what we have on sale this week”. The lowest open rate of any e-mail we had sent! Confused? Don’t be because there are a couple of reasons why. First, the list is larger now so a lower percentage open rate doesn’t necessarily mean fewer people received the message (More than 30 percent of the recipients opened, which is excellent). The success of the sale combined with the slightly below average open rate does indicate the strength of the relationship (AKA loyalty) with our client and his core customers. And that’s truly why a regular e-newsletter to your customers is the biggest no brainer in business, no matter what product or service you sell. 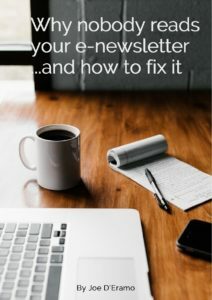 If you are interested in starting your own e-newsletter to enhance the relationship with your customers, please drop a line or give me a call at 617-848-0848. Better off dead? Why your subject line should make headlines. The last issue of “Changing Lanes” featuring the subject line “My father doesn’t like me” nearly broke a record for number of opens (that’s how many people actually opened the e-mail for you folks who do not use Constant Contact). While pleased with that result, it remains a bit troubling that an e-mail that contained an obituary of another “Joe D’Eramo” achieved the most opens since the re-launch of Changing Lanes in 2010.
must treat your subject line as your headline. If you do not give the reader a reason to open it, he or she will not. It’s just the nature of people these days. We only have a certain amount of time and if there doesn’t appear to be any news of interest in an e-mail, then we move on. works only once and then you risk losing your readers forever. But you do have to deliver a punchy headline that scratches an itch or piques their curiosity-then deliver the goods in the newsletter. service, tip on how to do something more cost-effectively. Then they essentially throw it away with a subject line like “News from …”. You’re probably saying “Joe, you’re just trying to justify people hiring copywriters to do their newsletters.” My answer, “you’re darn right I am!” But the greater point, whether you hire a writer to do it or not, is that you should put as much thought if not more into your subject line as you do the introductory paragraph of the newsletter. It doesn’t even have to be the most creative headline of all time. Just tell them why they should open your e-mail and you’d be surprised how open rates will rise. And that’s a whole lot easier than finding an obituary with your name on it.